COMMENTARY ON "BE WHO YOU ARE"
This places a condition on God’s power. If you give yourself to Jesus properly then his power is effectual, if you goof and don’t decide decisively enough during the altar call then his power is rendered impotent. That gives an image of a false god and places your salvation upon you rather than Jesus. This is the same flaw that Rome taught during the reformation, just watered down and repackaged for a new generation. Instead the text places the call on something that God does. I simply contend that “all” means “all” in this verse above. It’s not an impotent call it’s an effectual one. Notice above that it’s in the past tense. To the church peter is saying that her salvation is a done deal, signed sealed delivered. We have just had the gospel preached to us at the outset of the epistle, I wish more preachers followed that example. Peter of course changes gears next and gives us some law. Look closely at the first few words in verse 5. The reason we make every effort to keep the law is because of the gospel that we already have, not in something we long to receive. Because of what Jesus has done for you then do good works in joy. The law typically has three uses that different reformers organize differently. But stated at their simplest you have the following in no particular order. What Peter is preaching here is the second one I listed. It’s not to earn salvation it’s to be a guide. The notion that God gives you the power to do this is problematic. The Bible clearly states that God leaves us in a state of weakness in this life to demonstrate the sufficiency of his Grace. In the passage above Paul is struggling with sin in his life. We don’t know what it is specifically, he calls it a “thorn in the flesh”. Like Paul we will all have our thorns in the flesh during this life. In spite of this though we should strive to do our best to serve our neighbors, and in doing so, serve God. And this is what Peter is teaching us in the passage set aside for today’s lesson when he gives us some law. The only thing that I feel the need to point out in this lesson is that the author places man at the center of God’s actions. In doing so we are ultimately the deciding factor in God’s power, as if to imply that he needs our help. I addressed this in Saturday’s lesson already, and besides that issue there isn’t really anything wrong with it. The first paragraph does a fine job of presenting the gospel by faith along. In fact it would have been nice if he had just stopped there while he was ahead. Today’s lesson extols the virtues of good works and general Christian piety. It is important to remember that we do good works for our neighbor because he needs them. God doesn’t need your good works to help save you. The writer didn’t imply otherwise but it’s worth mentioning when the topic comes up so that none confuse the distinction between law and gospel. It is important to breakdown all three of the verses below, some only really read the first two it seems so I will post them all. Notice that chronologically after faith and grace good works come in. Just as you expect fruit to come from a tree one would expect good works to come from a Christian. Not in a quantifiable objective sense, but in a subjective one most certainly. Will you personally notice this change to doing good works in your life when you become a Christian? Maybe, and maybe not. If anything you may feel worse as your knowledge of your own sin grows. Christians especially need to hear the gospel often because of this. Here is a way of looking at such things that I find helpful and Biblical. Peter warns us in the passages being examined in these lessons about false believers. If you suspect that someone else is not really a Christian, identifying this by their works is not always easy. Like I said, these good works are prepared by God without conferring with any of us as to what they will be, and he does leave thorns of the flesh within us. So how do you know for sure if someone is really a believer? Well the truth is you really don’t. We can’t make binary distinctions like that and aren’t really called to do so anyways. If someone is obviously living an unrepentant lifestyle there is great cause for concern that they might be an unbeliever. Maybe they are in despair and need to hear the gospel, maybe they are prideful and need to hear the law. These are things for their pastor or elder to discern. The point is you are concerned for their unbelief not so much for the fact that they happen to sin. Asking them to pull themselves up by their boot straps and leaving it at that doesn’t do anyone any good. Let’s be honest though. I realize the author of today’s lesson didn’t say it but I will. When SDA say they mean believers do good works they mean believers keep the Sabbath. They don’t actually emphasize feeding the poor or something like that. This plays hand in hand with their false gospel regarding Sabbath keeping. The author of today’s lesson didn’t say this of course, but it is taught enough in Adventism that the average reader is going to see it that way anyways. Today the author gives an exposition on the SDA view of soul sleep. If you’re not familiar with an opposing view let me recommend a proclamation magazine that you can find HERE. This will give you a lot more detail than I can in a short quarterly commentary. That said, I would like to point out a few things in the Bible that SDA tend to gloss over when they teach soul sleep. These are things that bugged me when I was an SDA. First of all, when SDA quote 1 Thess 4 they always start with verse 16. Ever wonder why this is? Because just two verses prior there is a teaching that is irreconcilable with their beliefs. Wait…. The resurrection hasn’t happened yet! How are we being brought with him? The obvious answer is that you don’t cease to exist when you die. There is something of substance worthy of being brought to the resurrection. There are others too, why does Paul refer to the time after death and before the resurrection as something far greater? Just the fact that Paul is distinguishing between two places of being kinda says it all right there. This is absolutely irreconcilable with a cessation of existence. While there are certainly many unbiblical traditions associated with dying and going to heaven (harps and clouds etc) that doesn’t mean it’s all fake. Christians have always taught the reality of going to heaven when we die. It’s in the Bible and it’s taught throughout Church history. Even the Church fathers who knew the apostles and probably did ask them directly about such things spoke of Christians going to heaven when we die. This was a great comfort to them as they were being martyred. You don’t get soul sleep until much later. SDA for example needed it for their Investigative Judgment to work as you can’t have souls already in heaven or hell for a judgment to make any logical sense. If you ask me that’s special pleading, doctrines should come from scripture directly, not because you need them to support visions in a corn field. I am going to have to correct the author here, his implication is that peter denies that his soul will leave his tabernacle/body. Peter doesn’t deny this at all, in fact he uses language consistent with Paul’s, that Peter teaches is also scripture. Throughout the above pericope we see a juxtaposition between two things. One is in the body here on earth and the other is in heaven with God. Both necessitate some level of consciousness as we are said to be “being”, “dwelling”, “groan [ing]”, “longing”, etc in one or the other. No indication is given here of a pause between the two, and no Christian thought so until many years after the time of Christ. Why should we today eisegete a 19th century doctrine on soul sleep? The pioneers of Adventism needed the Investigative Judgement to assuage their guilt over wrongly guessing the date of Jesus return. After that they needed soul sleep to make the Investigative Judgment work. We don’t need any of that today though. We didn’t guess the second coming and don’t need all that false teaching that went with it. We should just let it go, let them be wrong, and take it as a cautionary tale for the future. Praise God that we go to heaven when we die. I really only have one comment to add to today’s lesson that I have not already made clear in this past week. Notice that Ellen White must refer to Church tradition to affirm the story of Peter being hung upside down on a cross, but the writer of this lesson isn’t going to take into account Polycarp, the disciple of John, who clearly affirmed that believers go to heaven and unbelievers go to hell in his epistle to the Philippians. I would be surprised if the writer of this lesson wasn’t aware of that interesting contradiction. 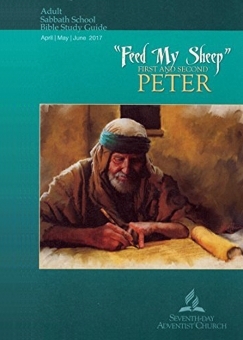 Why do they feel it’s ok to use the fathers for Peter’s story but leave them out entirely for the topic of soul sleep? Would their readers not be interested in an apologetic handling of that? Just my two cents on their final thoughts. Copyright 2017 BibleStudiesForAdventists.com. All rights reserved. Revised May 19, 2017. This website is published by Life Assurance Ministries, Camp Verde, Arizona, USA, the publisher of Proclamation! Magazine. Contact email: BibleStudiesForAdventists@gmail.com.